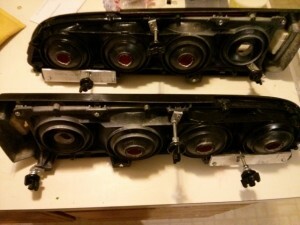 To convert my 81 Trans Am to a 78, both the front and rear bumpers and lights need to be swapped. The front bumper, headlights and grills are quite easy to swap, simply unbolt the front bumper, brackets and hardware and bolt-on a 77/78 front bumper and hardware. Specifically, the metal bumpers, foam inserts, front urethane bumper cover, headlight and grill header, headlights, grills and brackets. If you have a Trans Am, you will also need a lower center spoiler. Though it sounds complicated, it’s an easy swap. The rear bumper and taillights on the other hand, is far from an easy swap. There are really 3 basic ways you can do the conversion: swap the tail panels (body work), add new holes to the existing tail panel, or make brackets to adapt the older taillights to the newer tail panel. I opted for the 3rd option this way I was not adding more holes to the body and this allowed me the option to switch back to the 79-81 style bumper if I changed my mind later. The gas tank filler neck on a 79-81 Firebird / Trans Am is longer so it protrudes further out. When you open the taillight center door on a 79-81 the gas filler neck is right there, easy to get to. The 79-81 gas filler door is flush the the taillights. When you convert to a 77/78 (1976 is also the same rear bumper style but not as ideal, will explain that shortly), the gas filler neck is now covered by the license plate door. This door is recessed (not flush) in relation to the taillights. The inner sides of the 77/78 taillight housings hold the bezel for the lights that light up the rear license plate. The depth is enough that you cannot use a 79-81 gas tank. It is possible to get only the filler neck for a 77/78 Firebird and get that swapped by a gas tank repair/radiator shop. In my situation I decided to replace the entire tank with a 78 length filler neck since I suspected my old tank leaked anyway. 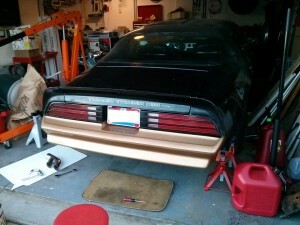 The rear bumper may require slight modification in order to fit at the tail panel center portion. I did not have to modify the 78 donor bumper I had, but the fit was very close, maybe 1/16″ gap between the bumper and the tail panel. I read somewhere that someone had to cut 1/16″ off their bumper cover to make it fit at the center portion of the bumper cover, so your mileage may vary. The license plate gas filler door will be tricky to figure out where to locate. I went by pictures of other cars to locate mine. The 79-81 trunk sheet metal includes a bit of extra metal just above the trunk key hole, mine had a band of rubber that the 79-81 gas filler door used as a stop. This will cause clearance issues, so watch as you mount your rear license plate gas door that it clears this lip. I may grind/cut this lip off once I decide to commit to this swap permanently. It is possible to use a 76 rear bumper, but I would recommend looking for a 77/78 instead. The 76 rear bumper was a 1-year only design. Rather than use a Styrofoam or plastic grate mesh to fill the gap between the bumper cover and the actual steel bumper, they filled the entire void with polyurethane plastic. These bumpers have a reputation for not keeping their shape due to the extra weight in them. Depending on the taillight harness your car currently has, you may or may not have to modify your wiring. My car, a 1981 Trans Am, had the rear harness that included 2 harnesses that took style 1157 bulbs and 2 harnesses that took interior style 194 bulbs for the parking and brake lights. The harnesses that take the larger 1157 bulbs will need to be modified slightly in order to get them to plug into the older 77/78 style taillight fixtures. In the process of going through my wiring I ordered a replacement pigtail and found the replacement pigtail fit without modification. I decided to order 5 more and replace all of the pigtails that the harnesses would plug into the taillight fixtures without issues. Note: I do not know how many variations of taillight harnesses there were between 79-81, but I do know that the Trans Am’s, Formula’s and regular Firebirds had different rear taillights. I believe the Trans Am’s had a smoked look and the parking lights were lit almost all the way across (minus the fuel filler door). One other advantage of using the existing 79-81 wiring rather than getting a 78/79 rear harness is with the gas tank fuel gauge wire. By modifying my existing harness I was able to maintain the same connector for the 79-81 gas tank sending unit. I wrapped all my new wiring in fleece electrical tape then covered everything with new 1/2″ wire loom and purchased new wire loom clips (Dorman 85656) to use the existing 79/81 wire loom mounting locations. The taillight housings you decide to use will need to be modified in order to make them fit within the confines of a 79-81 tail panel. More specifically, the passenger right side tail light fixture will need to be modified (as pictured) in order to clear the tail panel. Note that the mounting holes on a 79-81 tail panel are not uniform, the holes are offset differently on the left than the right because the left/drivers side also held the hinge for the taillight gas door. 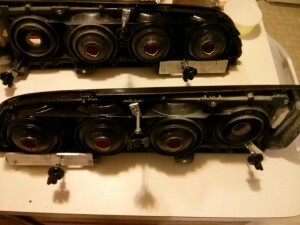 Once I had the taillights modified enough that I could hold them into position, I proceeded to cut the studs off the aluminum outer housing then drilled and tapped each mounting location with a 1/4-20 tap, approximately 3/4″ deep. I drilled and tapped all of them just in case I decided I needed them for mounting. I used 3/16″ thick aluminum plate (picked up a bar for $10 at a local hardware store) and cut pieces to fit different areas to relocate mounting holes appropriately. Each taillight mounted to the original tail panel with 8 mounting studs. My new brackets only mount with 3, so it was critical that the three mounting locations I picked were strong. I used 1/4-20 threaded rod cut to specific lengths for the new taillight studs. when I determined where to locate the studs in the aluminum stock, I drilled the holes, test-fit then tapped each hole with a 1/4-20 tap. Once I had all of the aluminum stock cut, drilled and tapped to my needs, I threaded the 1/4-20 bar stock into the holes ten secured them with nuts to act as a jam nut. I then used 2 additional nuts to locate the final positions against the rear tail panel using the 2nd nut as a jam nut. Washers finish the job, with the plan to add rubber washers between them and the body when done to make a water tight seal. 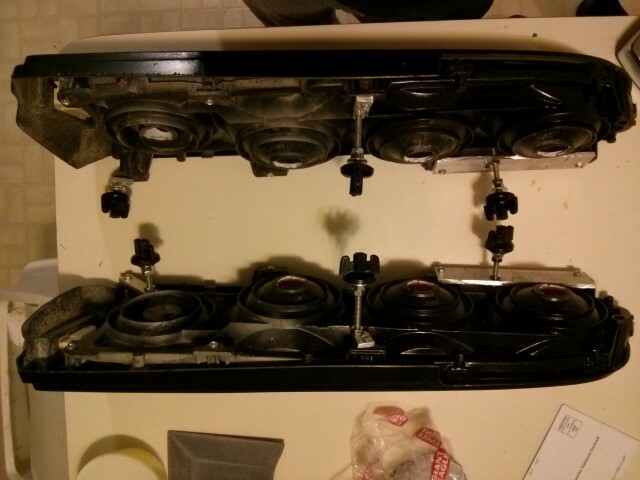 The remaining holes left uncovered will be plugged with rubber body hole plugs. Ames Performance sells the size I needed, which I believe was 3/8″ (don’t quot me on that diameter). The factory used large holes in the body, it is forgiving for this modification. Outer whale tail (rear spoiler) corners will need to be swapped with 70-78 styles. Take a look at some rear pictures of a 78 and compare with a 79, you will see the 70-78 sweep down into the rear panel to a point, where the 79-81 come down evenly with a square edge. 70-78 (that I have found anyway) are hard plastic, just like the center spoiler section of my 81. The 79-81 corner spoilers are urethane, so if you don’;t know what you have, take them off and look under them. If there is yellow, you have 79-81 rear spoiler corners. I am definitely swapping these, the 79-81 tails just look out of place with this rear bumper (see my pictures below). The will be swapped when I take the car in to get painted in the fall. Lower front and rear side wheel spoilers will need should to be swapped with 70-78 styles. 79-81 rear side spoilers have sharper turns in them, they look slightly more aggressive. The 70-78 style have a more gradual rounded corner to them. Look at pictures to see the difference. I am going to use my 81 wheel flares this summer. If it drives me crazy then I will order a set of Danko brand 70-78 wheel flares before I get the car painted. Note: I changed “need” to “should”, mainly because you can use the 79-81 wheel spoilers. Since I put larger wheels with lower profile tires on the car, I’m beginning to prefer the 79-81 spoilers with the wheels. If you decide to go this route, you need to use the lower chin center spoiler from 79-81 with the 79-81 wheel spoilers, as the 77/78 lower chin spoiler is designed to mate up to 70-78 wheel spoilers. Also important to note that the 79-81 lower chin spoiler bolts on along the core support, it may possibly work for all 70-81 cars that use 79-81 wheel spoilers. I see that this was posted 3 years ago so I don’t know if this will get to anyone but… I was wondering if to modified the tail panel any behind the taillights in order to route the harness to the lamps. On the 78 panel there is a hole behind each lamp for access. I did not modify the tail panel. My main goal was not to modify it in case I wanted to go back to the 79-81 rear panel. I believe the rear panel has 6 mounting holes on each side where my adaption only uses 3 of those 6. Because of this I plan on plugging the extra holes with body plugs. I hope this helps! Thanks for the reply. I actually completed my left side taillight yesterday. It looks great. Thanks for the post, this is saving me a ton of body work and about $300 not replacing that rear panel. Since I am changing the taillights to LED I don’t even have to worry about the lamp socket conversion. I would love to learn how you did the LED conversion. I am currently just running LED lights in the taillights, I know replacing them with full strips of LEDs would be better. I was test fitting my rear bumper yesterday and it seems to sit out abut 1/2″ to far back on the passenger side. nothing seems to be hitting. When you installed your rear bumper did you use the whole thing? from the mounting bolts to the body back? or did you use the 81’s bumper mounts on the 78 bumper? I thought it would bolt right on but now I’m seeing problems. Any insight would be appreciated. I did not have alignment issues. You could have a warped rear bumper, or your car was previously repaired and the bumper you took off was massaged to fit the repair. Do you know the history of the car, could it have been in a n accident in its past? You should be able to make some criss cross measurements of the studs and points of the bumper, all measurements should be the same.You can do the same on the car as well as on the bumper to determine if something is misaligned. Im in the process of buying a 77. And i like the 79-81 taillights way more than the 77’s. Would 79-81 taillights fit or do i then need to replace the whole panel? 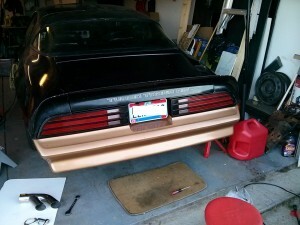 You would need to replace the tail panel or build your own taillight. The 79-81 tail panel is recessed differently, making the trunk area slightly different than previous years. you can easily adapt older tail lights to a 79-81 tail panel by making a couple modifications to the tail light assembly, but going the other direction is more difficult in that the 78 and older tail panel has large hole openings for the taillight light wiring which would need to be plugged, also requiring the 79-81 tail lights to be modified as well. Keep in mind that the gas tank filler neck, rear bumper steel and bumper cover is also different, so you would also need to get a 79-81 rear bumper and bumper cover as well as modify your gas tank to make the combination work. I just bought an 80 formula and would like to swap to 70-73 tail lights.. how involved do you think this would be. I can’t find much on the net on this swap. Thanks in advance. This would be very involved. It has been discussed before on the 78ta.com and transamcountry.com forums. Here is a tip, try doing a google search specifially to each site. e.g. Type each into Google search. Try other keywords as well. I personally would not do a 70-73 rear conversion, a lot of work involved as you would have to change the tail panel and how the rear bumper attaches.